The latest design box tipper from Tong Peal is the model 150 tipper. The new 'extra tip' mechanism is shown in this picture. This simple but effective feature has increased the angle of tip from 123 to 150 degrees so boxes are emptied correctly. 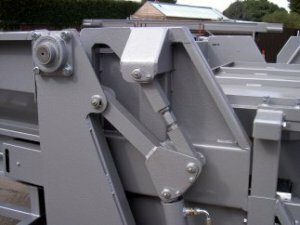 The box tipper is a corner pivot model with twin hydraulic rams. It is automatic via micro-processor and sensors but does have a manual override. It also comes complete with box movement siren and box empty beacon. For safety the machine is fitted with light guards.